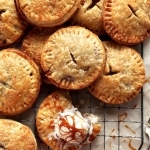 Sweet ginger-spiced pear hand pies, flaky pastry and caramelized pear filling packed with favorite fall flavors – ginger, cinnamon, cloves, and vanilla – everything to love about traditional pie, in deliciously convenient hand-held form. Despite my last Summer fling, the apples and pears and pumpkins have since taken over our pantry, settling in comfortably next to our restocked supplies of butter, brown sugar, apple pie spice, and the like – all the necessary ingredients of this cozy season. We’ve been hunkering inside most of this week, escaping what feels like one continuous week-long rain storm (but thankful that we’re only getting the edge of Hurricane Florence here in D.C.). On the one hand, I’m feeling pretty cooped up with an energetic one year old to entertain all day, but it’s also given me ample opportunity to get a jump start on fall baking. 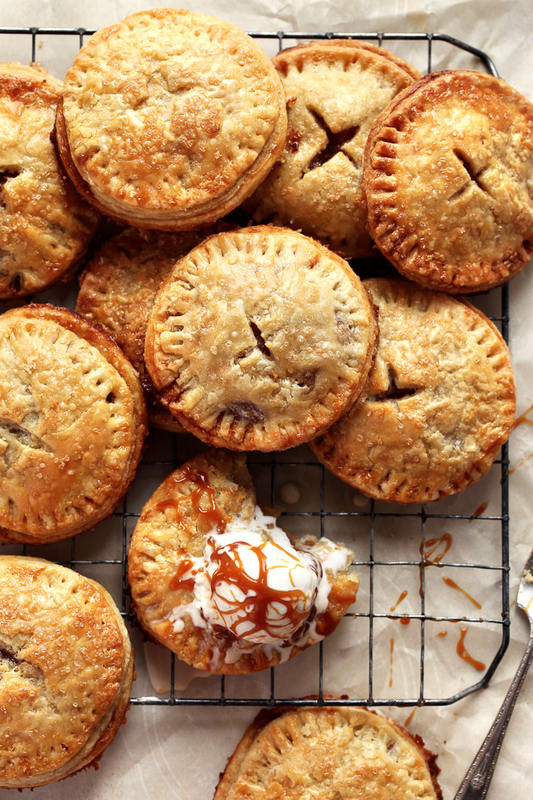 First up, ginger spiced pear hand pies – with a buttery, flaky pastry, and an irresistible vanilla bean flecked, brown sugar pear filling – that pack everything to love about traditional pie into portable pockets of deliciousness. 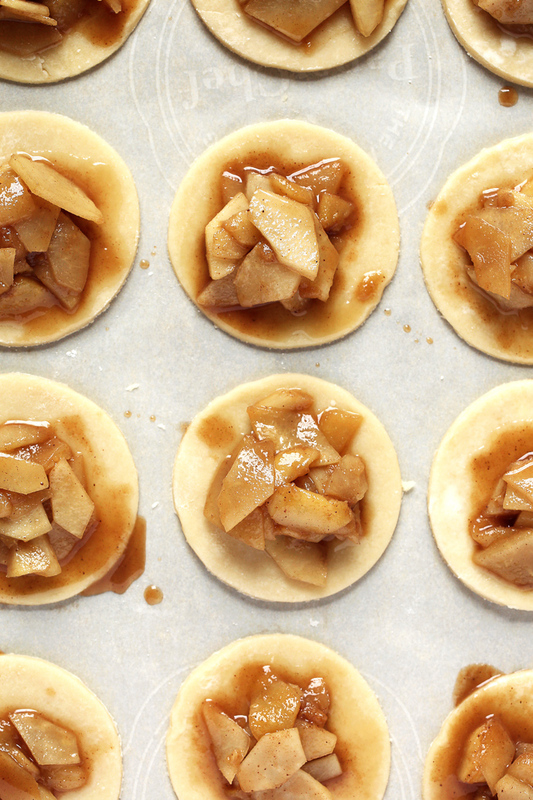 These delectable little pastries are inspired by one of my favorite fall treats – classic apple hand pies. I first shared them on the blog a few years ago, and always make sure to bake up a batch or two at the start of apple season, often freezing half to rediscover sometime in the middle of Winter. Individual hand pies are admittedly a little bit time consuming to make, but the commitment aside, are oh so easy. Make the pie pastry. Let it rest while you cook the pear filling. Assemble, bake, devour. Simple, simple. I picked up some golden, bespeckled pears this week, and after roasting a few, it seemed fitting to adapt that tried-and-true hand pie recipe to the leftovers, leaning heavily on the much-loved combination of fragrant ginger and vanilla, along with other classic warming spices – cinnamon, nutmeg, and cloves. The pears become soft and caramelized as they cook down in butter and brown sugar, while the ginger (a combination of both fresh and dried, ground ginger) adds a welcome warmth and spicy, aromatic flavor that balances the sweetness of the pear. 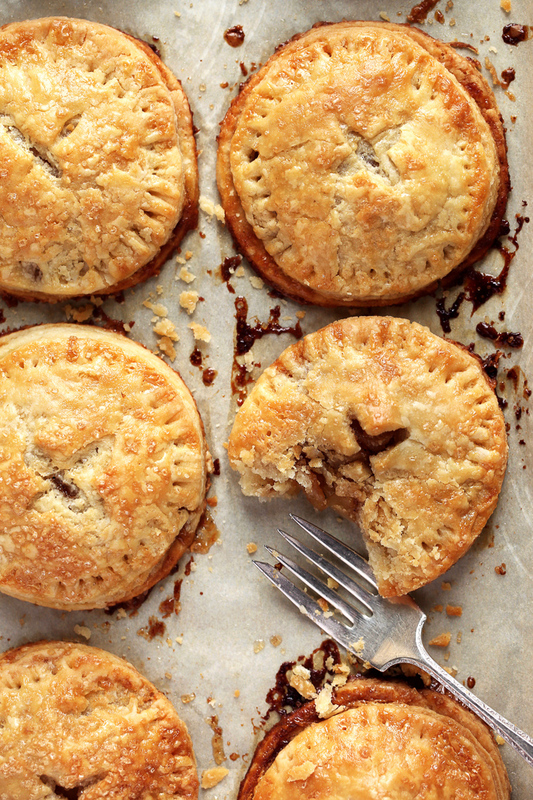 Wrapped in a buttery pie crust, these pastries are unsurprisingly… wonderful. Be sure to also check out my classic apple hand pies, and if you love ginger and pear together as much as I do, then this easy puff pastry tart is for you! And now a favor. I’ve got pie on my mind and am already scheming about the myriad of delicious options we could bake together for the upcoming holidays. So tell me – are there any flavors you’d love to see on the blog? Let me know in the comments! Recipe photography by Laura Kasavan, unless otherwise noted. Find more of her gorgeous desserts on Tutti Dolci. Make the pie pastry: In a food processor fitted with a metal blade, pulse together the flour, sugar, and salt until well-combined. Add the butter and shortening to the flour mixture and pulse a few times until the butter and shortening pieces are evenly dispersed, with the largest pieces about the size of peas. Add the ice water, a tablespoon or two at a time, and pulse to combine, until the dough is evenly moistened. Pinch a bit of dough together between two fingers to test – the dough should stick together. If the dough seems dry, add a few more teaspoons of water and pulse again. Transfer the pastry to a clean, well-floured work surface, and divide the dough in half. Gather each half of dough into a ball, then flatten into a round, disk, and wrap tightly in plastic wrap. Refrigerate for at least an hour before you begin to roll out the dough. Make the pear filling: Heat a skillet over medium-heat. Add the butter, diced pears, brown sugar, fresh ginger, and spices to the pan and stir to combine. Cook until the butter is melted and the pears are just soft, but not mushy, about 2 minutes. Remove from the heat, and transfer the pear filling to a mixing bowl to cool. Set aside and let come to room temperature. Make the hand pies: Preheat the oven to 375 degrees. Line two sheet pans with parchment paper. Set aside. Remove one of the dough disks from the refrigerator. Roll the dough out on to a generously-floured piece of parchment paper, until it is about 1/8-inch thick. Using a 5-inch-diameter cookie cutter/biscuit cutter/tea cup saucer etc., cut out six circles. Re-roll the dough as necessary to achieve all six. Lay the pastry cutouts on one of the sheet pans and top each with a spoonful of the pear mixture, being sure to reserve as much of the pear liquid as possible. Adding too much liquid to the pies will get messy, quickly. Fold the dough in half, and use your fingers to gently press the edges together. Using the back of a fork, gently press down to create a fluted seal along the edge. Lightly brush the top of each pastry with cream, and sprinkle generously with Demerara sugar. Cut a small x-shaped slit in the top of each pie, and repeat these steps with the second dough disk. Bake for 20-30 minutes, until the pies are golden brown and cooked through. Let cool for 10 minutes on a baking rack. Serve warm with a dusting of confectioners sugar, a drizzle of caramel, and a scoop of vanilla ice cream. 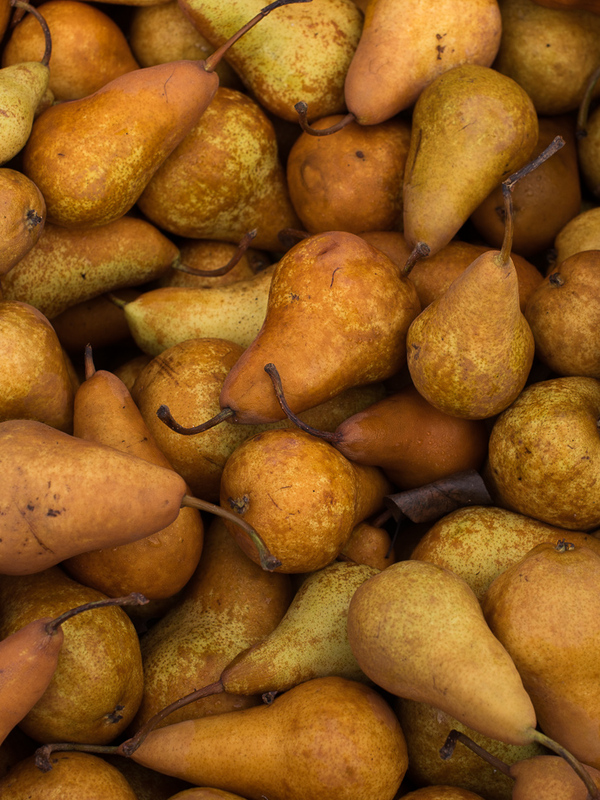 ¹ Look for variety of pear that will hold their shape and texture when cooked, such as Bosc or Anjou pears. ² I love the combination of using both fresh and ground ginger, but if you don’t have fresh ginger paste (which I usually find in a tube in the refrigerated section with other fresh herbs), use a total of 1/2 tsp of ground ginger. Thank you for this recipe! It is perfect for winter holidays! How about a custard pie with the flavors of fall, like cinnamon, ginger, nutmeg? That sounds perfect 🙂 Thanks, Leanne! 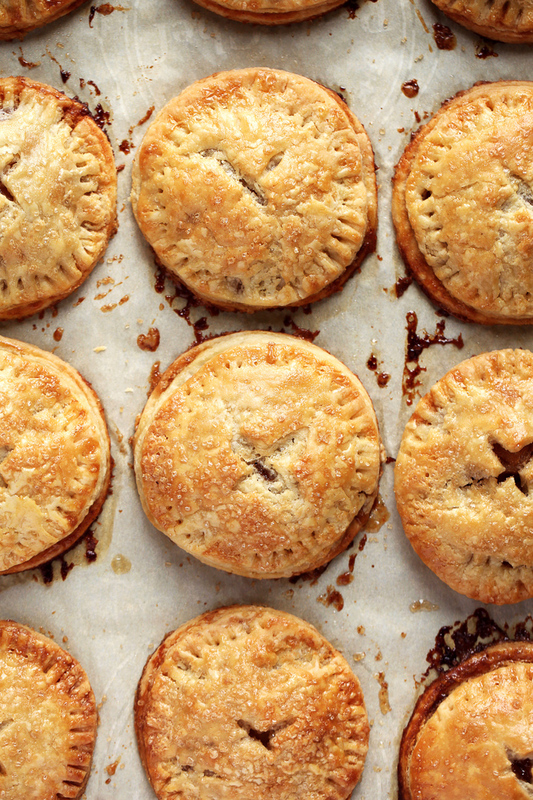 How about making a nice mince hand pie. I usually make mince pies in the fall, and I wonder if you have a good recipe or, like myself, do you buy commercially prepared mince meat? Hey Laura, I’d love to see a recipe that’s a twist on traditional pumpkin pie.